Gauge One (1:32 scale), Electric. Painted Black with Red Buffer Beams - Not lettered. Fitted with Stanier 4000 gal tender. 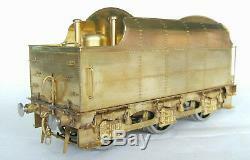 This is one of the Fine Scale Brass (UK) models built by San Cheng Craft. (More photographs will be furnished later). Modelling at its best - accuracy and details - down to the radius of curvature of window corners, wheel spoke profile... All parts were hand crafted. 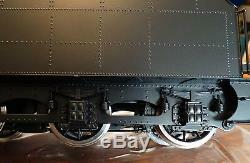 The only photo-etched piece on these models are the fall plate behind the cab. Only screws used are for mounting body to the chassis and in the motor/drive mounts. Models were built to be real collectible. Steel ball bearings on all axles. Sprung buffers and screw couplings. 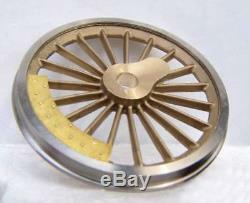 Correct wheel profiles with stainless steel tires. Factory painted ready for lining. More photos of the painted model will be added later. Factory painted black , not lettered. From factory owner's collection. 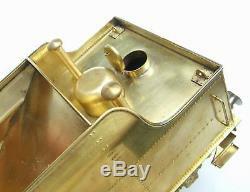 The item "Brass Hand Made. 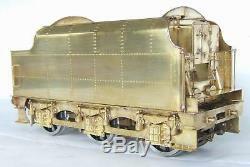 Gauge One LMS Class 8F Fine Scale Brass series by SanCheng" is in sale since Saturday, November 10, 2018. 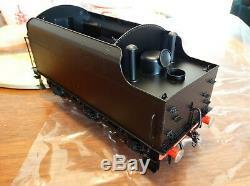 This item is in the category "Toys & Hobbies\Model Railroads & Trains\O Scale\Locomotives".l4rkvdaxe" and is located in Voorhees, New Jersey. This item can be shipped to United States, Canada, United Kingdom, Denmark, Romania, Slovakia, Bulgaria, Czech republic, Finland, Hungary, Latvia, Lithuania, Malta, Estonia, Australia, Greece, Portugal, Cyprus, Slovenia, Japan, Sweden, South Korea, Indonesia, Taiwan, South africa, Thailand, Belgium, France, Hong Kong, Ireland, Netherlands, Poland, Spain, Italy, Germany, Austria, Bahamas, Israel, Mexico, New Zealand, Singapore, Switzerland, Norway, Saudi arabia, Ukraine, United arab emirates, Qatar, Kuwait, Bahrain, Croatia, Malaysia, Brazil, Colombia, Panama, Jamaica, Viet nam.